Tonight we continued on with last night's grilling preparations. While I hated the idea Jen had last night of grilling for the week I became a much larger fan tonight when all I had to do was start the oven and throw a bunch of stuff together. 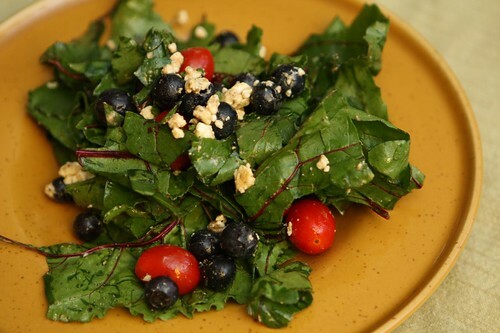 In an effort to work a few more healthy elements into our meals I started up by using these fresh beet greens to make a salad with blueberries, grape tomatoes, feta, balsamic vinegar, olive oil, salt, and pepper. In an effort to eat things that look more like snakes I made this rope sausage. While the oven heated up I carmelized some vidalia onion and red onion with garlic and chopped Russett potato before throwing them in the oven to roast. 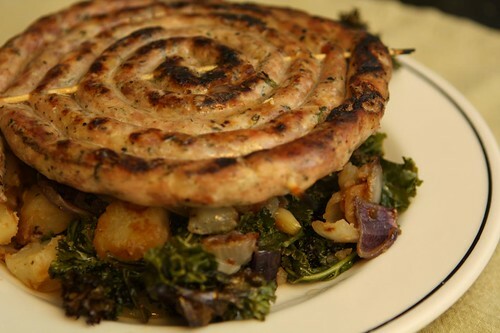 When they were done I threw in some kale and topped them with the grilled rope sausage for about ten minutes. 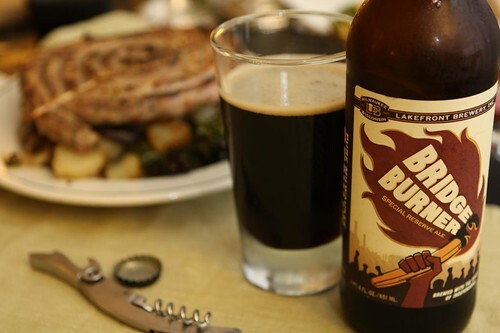 With the new varieties of beer slowly dwindling I opened up this Bridge Burner from Lakefront Brewery, Inc. This is a far more bitter beer than I would really choose to have under normal circumstance but even thought it's not my normal style of preference I could certainly appreciate it. And there you have one of the most boring entries I've ever written. Every meal has a story, it's just that sometimes they're not really worth telling.